Everglades National Park is the only subtropical preserver in North America. The park is known for it's rich bird life and is the only place in the world where alligators and crocodiles exist side by side. Biscayne National Park is a delight for wildlife-watching, snorkeling, diving, boating, and fishing. The park contains the longest stretch of mangrove forst left on Florida's east coast and a spectacular living coral reef. 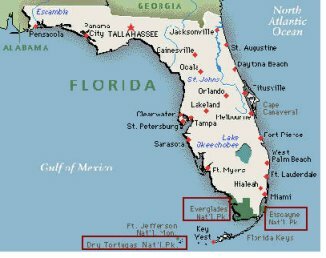 About 70 miles west of Key West is the Dry Tortugas National Park, a cluster of seven islands, composed of sand and coral reefs. Located on one of the islands is Ft. Jefferson, the largest of the 19th century American coastal forts. The area also is known for its legends of pirates and sunken ships.